About The Book: Vibrant and Athletic Emmi is preparing for the soccer game that will make her future. College recruiters are swarming the stadium in hopes of finding fresh talent. One thing is setting Emmi back from playing her best, a horrible cold. Feverish and congested she still insists on playing the game with all the strength she has. Mid-game things start to go against Emmi and she suddenly takes a turn for the worst. Everything has changed for Emmi, she doesn't care about the latest school gossip, who her friends newest 'boy toy' is or what she is going to do Friday night, all she is worried about now is when she will get her new heart..and will she survive the transplant surgery? My Thoughts: I don't know exactly how to start off this review. For the most part I really enjoyed this book. I laughed, I cried, but there were a few things that held me back from liking the book a lot more. For example without giving to much away, the character Sam. Sam is Emmi's boyfriend and there was something about their relationship that drove me nuts. Emmi's mother also irritated me at times with the way that she dealt with certain things like Emmi's relationship with Sam and at times the way she dealt with Emmi overall. 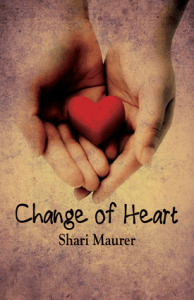 What I really liked about the book was that Shari Maurer was able to deliver a powerful, heavy plot line without making the book depressing. The author was also very realistic with the way Emmi dealt with the whole situation, nothing was sugar coated, Emmi made it very clear that she was angry at the hand she was dealt. Emmi's main emotion was anger, not sadness and when she was happy, she was hilarious. I loved her and Abe's relationship. Abe had me cracking up at times and was able to make light out of an unfortunate and scary situation. Emmi is a very strong character, it was like the author was living inside the mind of a teenage girl, Emmi dealt with things like a typical teenager would. She thought she was an invincible 16 year old and when this happened to her, she dealt with it like a normal teenager would, she was mad and she sulked. The First half of the book really hit home with me. When I was 16, I was in a similar situation like Emmi, only it was my lungs that we're causing the scare not my heart. When she would go into description about how frightened she was or how she felt like a "baby" it almost brought me to tears because I've been there. I know exactly what it felt like. I really related to Emmi right from the beginning. For the most part I really liked the book. It is a heart-wrenching but also a heart-warming story about a young girl trying to get her life back. For people that really like young adult novels, and don't mind a heavy plot, then this book should be a perfect read for you. I've have also awarded you the Versatile Blogger Award.